It’s like two planes joined at the wing…. If you’re someone who’s traveled in your life, you’ve probably seen all kinds of airplanes, big and small. But, none of them have been as large as this baby. It’s called the Stratolaunch, and it’s designed to launch satellites or other payloads into low-earth orbit. 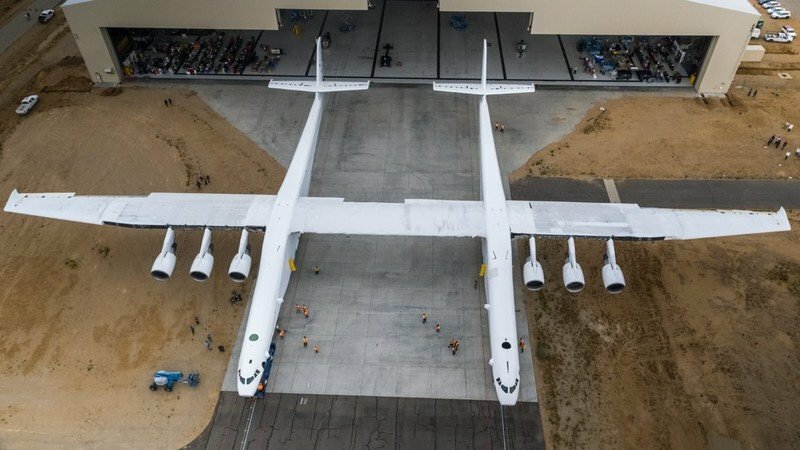 Essentially two planes joined together at the wing, the Stratolaunch uses six Boeing 747 engines, enough to allow a payload capacity of over 500,000 pounds. It can hold enough fuel to offer a range of up to 2,000 nautical miles. That means it can deliver different payloads into multiple orbits during the same flight while saving money over the traditional three-stage launch systems currently used on a regular basis. When it’s time to launch, up to three Pegasus XL air launch vehicles will be attached to the central pylon between the two fuselages. Once the plane has taken off and reaches a certain altitude, the ALVs, which will be equipped with their own rocket boosters, will then propel themselves the rest of the way into orbit. 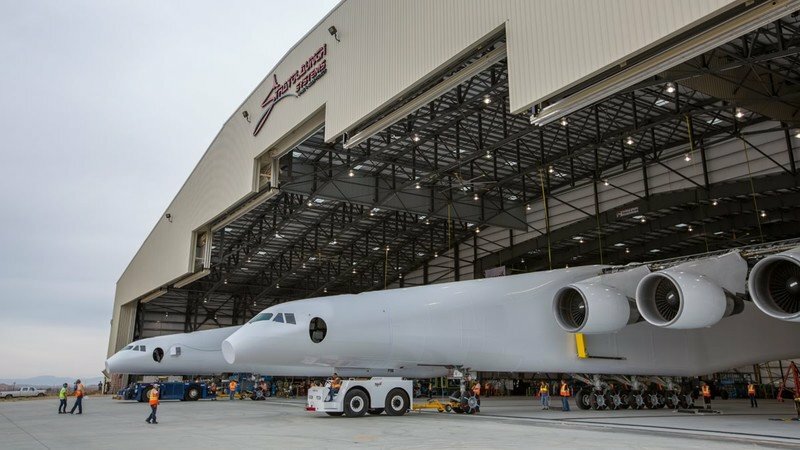 The plane is designed to carry up to three of the Pegasus XL ALVs at a time, each carrying a 1,000-pound satellite. In the future, different launch vehicles that run off solid or liquid fuel could be used, ultimately boosting the maximum size of satellites that could be carried toward the great unknown. But, before that happens, it needs to get off of the ground. For now, it’s currently being put through a fueling test. Extensive engine testing will then happen, followed by on-ground taxi runs. The initial test flight, which will be under experimental certification from the FAA, should take place by the end of the decade if everything goes smoothly. When I said the Stratolaunch looks like two planes joined together at the wing, that was an understatement in terms to the sheer size of this thing. 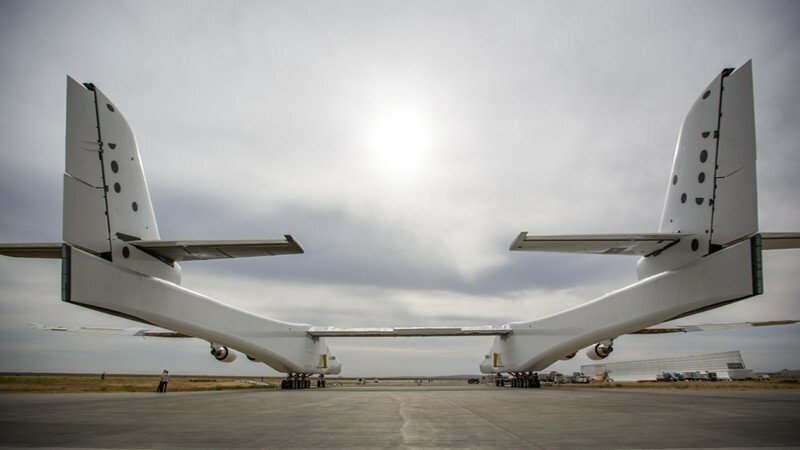 When I said the Stratolaunch looks like two planes joined together at the wing, that was an understatement in terms to the sheer size of this thing. It’s 238 feet long and has a wingspan of 385 feet. To put this into perspective, that makes it more than triple the wingspan of a Boeing 737, which has an 113-foot wingspan. So, imagine three of those people haulers sitting wingtip-to-wingtip, plus another 46 foot, and that’s how wide this thing really is. The tail or tails sit 50 feet high, and maximum takeoff weight is a staggering 1,300,000 pounds – talk about moving weight. But, moving something that big through the air takes a lot of power, hence the six Pratt & Whitney PW4056 Engines under the outside wings. Each is good for anywhere between 52,000 and 62,000 pounds of thrust for a total of 372,000. Why Not Use Traditional Rockets? The Stratolaunch project was founded in 2011 by Paul G. Allen, a co-founder of Microsoft, with the intent of making it easier to access space. 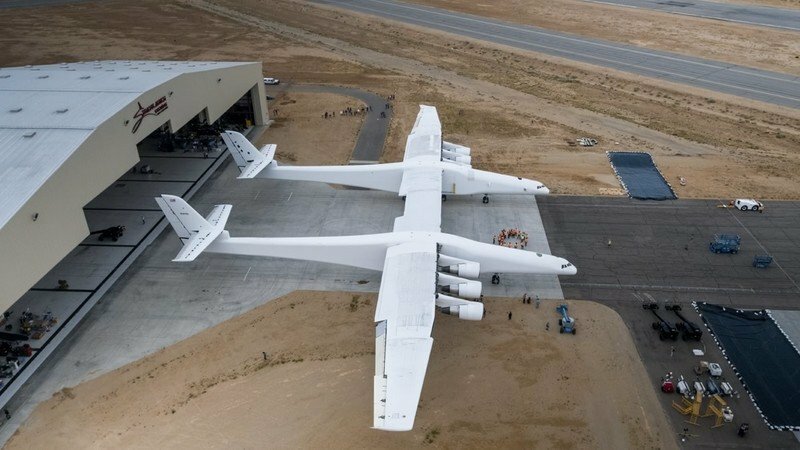 While he’s successfully built the world’s largest plane by wingspan as of the time of this writing, the Stratolaunch is not the first “air launch to orbit” systems as a way to supplement those massive three-stage rockets. There are two main contenders in this segment right now: Virgin Galactic and NASA. White Knight 2 (which also has twin hulls) will haul a pod called SpaceShipTwo that will be released around 50,000 feet and will then carry its passengers to the edge of space. NASA’s system will make use of a tow plane, a glider drone, and a rocket. So, what is the point of these alternative launch methods? Well, there’s two parts to that equation. First off, it’s cheaper as companies aren’t using multiple stages of disposable rockets to get their payloads off the ground and into space. The Stratolaunch, as an example, will use just one rocket. That means less fuel consumption, less waste, and less money spent. The other big reason is more about flexibility. Have you ever noticed how rocket launches typically have very tight windows and the even mild changes in weather can delay a launch for at least a day? That’s because traditional rocket launches require the earth to rotate to just the right point for the rocket to reach a specific point in space. Air launch systems like the Stratolaunch, however, are limited only by the availability of really long and wide runways. Otherwise, it can take off and land whenever deemed necessary.